Today, Feathered Quill reviewer Anita Lock is talking with Lorenzo Petruzziello, author of The Love Fool: A Rome-antic Comedy. FQ: You were inspired to write this book during your temporary stay in Rome, Italy back in 2011. What was it about Rome that inspired you to write? FQ: Who would you list as “exceptional writers”—those who inspire you to write? PETRUZZIELLO: I love to read, but I struggled to find a voice to which I can relate. It wasn’t until I reread The Great Gatsby that I felt like I was at home. I appreciate Fitzgerald’s observations and the slightest details when describing two people attracted to each other. I enjoyed this particularly in Tender is the Night. Of course, I like the brash and forwardness of Hemingway. For contemporary writers, I appreciate the delivery and style of Ian McEwan – Atonement is one of my favorites. And the storytelling of one of my favorite contemporary Italian authors Fabio Volo. FQ: Is there any correlation between the plot and your life, or is it totally a work of fiction? PETRUZZIELLO: Alex has a lot of me in him, but he’s not me. I used my experiences as the anchor to this story. For example, I worked for American Public Television, the major distributor of programs to public television stations across the country. Most of my work was on how-to programs and their national channel called CREATE TV. My role was marketing and publicity for shows on cooking, travel, gardening, home improvement and such. I made my main character Alex have a similar background because it’s what I knew. At APT, one of my first projects was for an international cooking series called New Scandinavian Cooking – the show – still airing – is hosted by Scandinavia’s popular culinary professionals and focuses on modern and traditional Nordic cuisine. When I got to thinking about La Dolce Vita – in which the celebrity was a whimsical, blonde ethereal movie star played by Swedish film star Anita Ekberg – I thought, I will make my celebrity Scandinavian too – OH! How about a Scandinavian cooking host? I have some experience with that. And the celebrity chef concept has been around for a while now. So, I thought the idea could be comical: for the ridiculousness of the label celebrity chef, and for the fun journey on which Pernille takes the reader. FQ: Amid your quick read, you mention a variety of iconic places and works of art. Obviously, they mean more to you than just incorporating them into your plot. Did any of them specifically inspire you in your writing process? PETRUZZIELLO: Absolutely! Again, living in Rome allowed me more time to really get to know the city. I mean, I’ve been to Rome a few times already and seeing the usual sights. But this time, I made it a priority to see sights that are either overlooked or not able to be fit in to tight tourist schedules. Villa Borghese is my favorite to this day-It’s an absolutely gorgeous park. Strolling the gardens I eventually make it into the Borghese Gallery museum. Being there just fueled my creativity, adding even more life to my story concept, so I had to put it in the book. But I didn’t just add it in the story, I wanted to make the space a part of the story. FQ: You incorporate a cat sanctuary in your story. Does this sanctuary actually exist in Rome, or is this something that you made up? PETRUZZIELLO: This is actually a real place. I didn’t live too far from here, and sometimes I would go by and watch the cats frolicking; allowing my mind to wander and come up with more for The Love Fool. Again, I think of my book as a Rome 2.0 – meaning: if you’ve visited Rome and its famous tourist attractions, The Love Fool will take you back and make you feel like a local. FQ: You incorporate passive-aggressive conversations within Alex and Emily’s relationship, which is a perfect story enhancer. Would you say this type of behavior is or is not common among people who are still processing who they are and what they want out of life? PETRUZZIELLO: Yes. Simply, yes. OK, sure, not everyone acts the same, but I specifically made Alex and Emily this way as my personal nod to Jane Austen. When I was introduced to Pride & Prejudice I fell in love with the tension, hatred, stubbornness, and attraction between Elizabeth Bennet and Mr. Darcy. I wanted to give my characters that same intensity. FQ: You close with a surprise ending, which seems to indicate that there may be an upcoming sequel. Is a sequel in the works? PETRUZZIELLO: No. I honestly don’t think a sequel would be necessary, nor interesting enough to read. The Love Fool is meant to be a basic message to men and women: Don’t be a fool. FQ: You provide plenty of encouragement for other burgeoning writers. Now that you’ve had a fair taste of the process, what do you foresee will be future literary projects? PETRUZZIELLO: I think we will continue to see more independent writers in the forefront. Just like other industries, creatives don’t have to stop if they don’t land a big publisher. More and more small publishers are out there offering more doors to open for first time writers to establish themselves. I went through a hybrid publisher – Inkshares – and it allowed me to test the waters with presales. Fortunately, I made it through by the skin of my teeth, but so happy that I have a small publisher to represent The Love Fool. FQ: Do you see yourself getting involved in writing conferences for new writers? PETRUZZIELLO: I wouldn’t be opposed to it. I mean, I think writers would like to hear more stories about other writers that found a way, and I’d be happy to share any insights on the struggles of a non-writer writing. I consider myself more a storyteller than a writer. I feel that the label writer should be awarded to those who have actually studied the craft of writing, prose and such. I never have. I’m just a guy with great stories to tell, and for some reason, I think they are so amazing I’m sharing them with the world. FQ: Are there any genres that you’re interested in, but apprehensive is holding you back? PETRUZZIELLO: Noir. In fact, the new story I’m working on has more of a noir-type style to it. As you can see, I’m still ironing out what my writing style will be. I am veering away from the romantic comedy label – it’s actually not the type of stories I prefer. 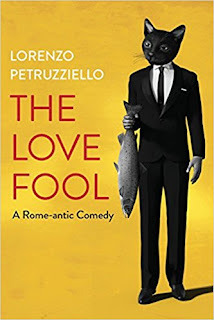 So, it’s funny that my debut novel is a romantic comedy – but, it’s what The Love Fool was created for and meant to be. But now, a slightly darker side is ready to emerge.